On Saturday I packed a picnic lunch to take to the Hapgood Wright Town Forest near Walden Pond. My gluten-free goodies included a ripe avocado, a few small tomatoes, a chunk of goat milk cheddar cheese, a plastic container of leftover quinoa salad, an energy bar, some popcorn, a paring knife in an orange sheath, a fork and a small cutting board. That it all fit exactly and neatly into my insulated lunch bag felt deeply satisfying. After spending a few hours exploring the woods, I left to comply with the two hour parking limit and took a short drive. Upon returning, I retrieved my lunch bag and walked to some benches placed by a small body of water, covered with lily pads, known as Fairyland Pond. After choosing a bench, I unpacked the bag. I looked forward to slicing the avocado, cutting it into small pieces, and mixing it into the quinoa salad. I had planned to slice the tomatoes and cheese, too. Except the knife was nowhere to be found, ditto the fork, even though I remembered retrieving them from the kitchen. I believed they had made it into the bag, too. Huh! My perfectionist inner critic, always looking for an excuse to pounce, bared its teeth as it prepared to lambaste me for spacing out on the utensils and therefore “ruining” my plans for a pond side picnic that I’d been looking forward to for a few days. Luckily, I caught the critic in time and shooed it away before it could heap further abuse. In the past, I might have believed that the absence of eating implements necessarily meant 1) forgoing the picnic and grudgingly returning to civilization to find a knife and fork so I could eat “properly”, 2) making a mess eating with my hands which might have impacted my enjoyment of the food or 3) eating only the granola bar, popcorn, cheese and tomatoes, which could be neatly munched without utensils but made for a bizarre combination and wouldn’t be as nourishing. From my Feldenkrais training, I knew there had to be at least one more way to deal with my internal experience of impasse and disappointment and with the practical matter of eating food that seemed to require utensils. Possibilities abound, if only we are able to put our conditioning and self-image aside to consider them. Rather than fretting about my forklessness, could I turn the situation around and enjoy my picnic anyway, even with my self-imposed constraint of not using my fingers to scoop quinoa and oh-so-slippery avocado into my mouth? Could I remember, even though no one but birds, squirrels and perhaps pond fairies could observe me, to not care what my improvisation looked like as long as it felt good and improved function? I stared at the food and its packaging as I considered my options. Could I use the plastic container’s lid to scoop the quinoa into my mouth? That seemed awkward and ran the risk of major spillage. I opened my small backpack to see if any of its contents resembled a cutting or scooping device. Nothing did. But I knew I’d be unhappy leaving my perch in search of a knife-like object so I simply took the next step. 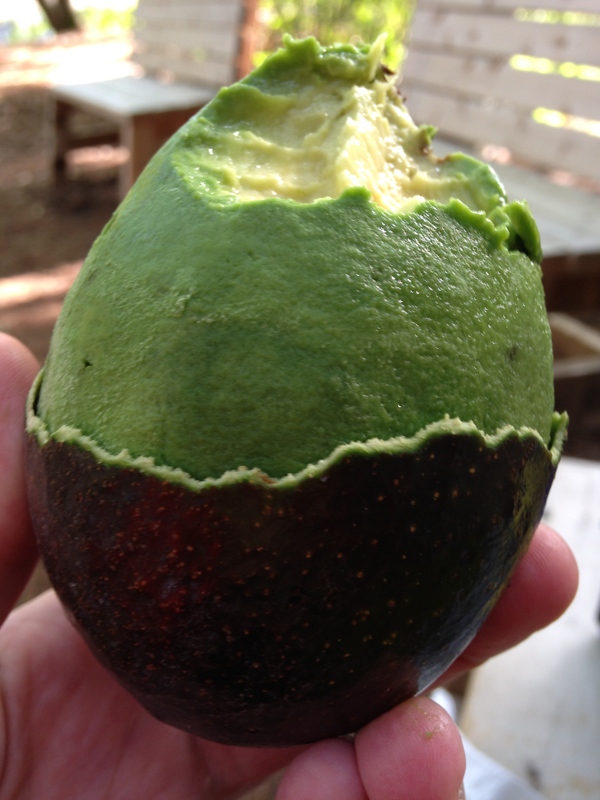 I held the avocado in one hand and began to peel it with the other, as if it were a banana, something I had never needed to try before. To my surprise, the skin slipped off easily in strips, rather than coming off in small bark-like chunks as I expected, revealing the top half of the fruit. It occurred to me to leave skin at the bottom as a handle. That allowed me to eat the avocado as if it were an ice cream cone, taking small bites from the top and working my way around and down. Using this technique made me laugh: even though I no longer eat frozen dairy desserts, I could still enjoy the hand-mouth coordination that’s part of the movement called “ice cream eating”. 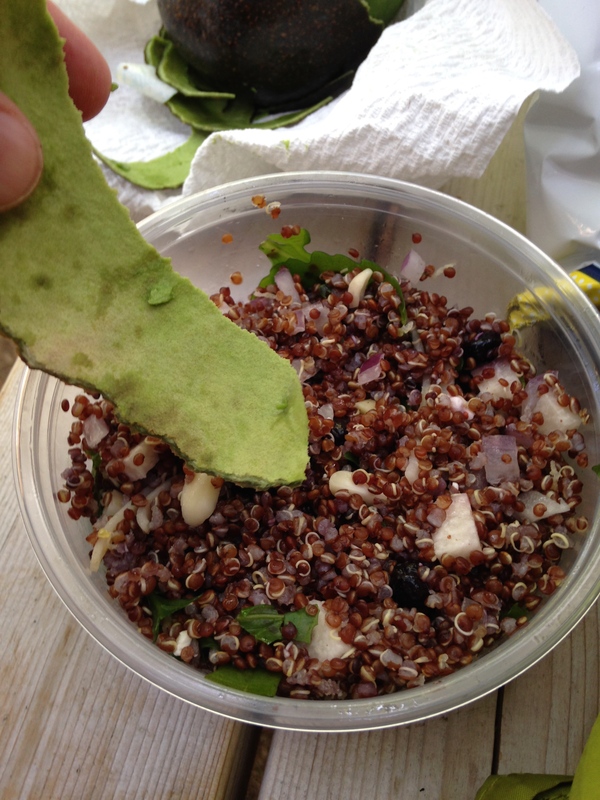 Next I used a strip of avocado skin as a spoon for the quinoa salad. The process of eating in this unorthodox way kept improving on its own: as I ate more of the avocado, it freed up larger pieces of skin, giving me a bigger and easier spoon to use. Part of the beauty of practicing awareness, rather than thinking too hard, is that the impossible becomes possible, as if by magic. All I had needed to do was get out of my head, get started, and remain present for an elegant solution to arise. Perhaps, in this case, pond fairies were involved, too.